Bob Battle, a Virginia attorney who focuses on DUI defense and reckless driving cases, has been our client since 2006; he’s one of our original clients! Bob’s practice is very focused. Virginia is well known for its stringent reckless driving laws, and with I-95 running right through Richmond, he gets cases from local residents and out-of-town visitors driving through Virginia. Because of these specific needs, we had to build him a site that would attract and convert this highly targeted demographic. What we did: All of our clients receive a mobile website along with their traditional desktop design. However, for Bob, a mobile site wasn’t just a bonus, it was necessary for his success. 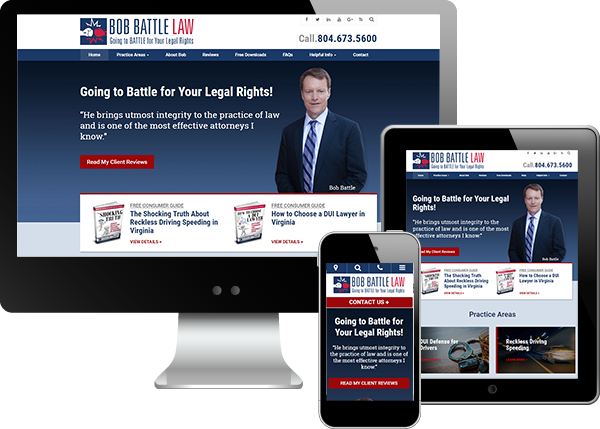 Although we have found that DUI attorneys attract more mobile traffic than other attorneys, Bob’s mobile traffic is even higher than average. In fact, Bob gets more mobile traffic than any other attorney with whom we have worked. His mobile site traffic now eclipsing that of his desktop site: 47 percent coming from mobile and only 45 percent from desktop. Why does it work? Bob’s mobile design works well because it’s clean, intuitive, and fast. In fact, when evaluating his site using Google’s PageSpeed Insights, he gets nearly perfect scores for both User Experience (100/100) and Speed (92/100); much higher than the 50 percent considered “excellent” by Google! What we did: In general, we design sites with a standard, short contact form. This encourages potential clients to fill out the form, because detailed forms can scare some people off. However, for Bob we created a very detailed contact form. On the form he asks where you got your ticket and what you were charged with. Why does it work? This works for Bob because he wants to weed out the clients he doesn’t want to take—no need to waste his time or theirs! This form works very well for him, as he’s able to quickly determine which cases he wants and which he will refer out to another attorney. What we did: We helped Bob create and promote his free offers. His offers are meant to inform his audience and decrease the number of contacts he gets for cases he doesn’t want to handle, much like his contact form. To help with this, we displayed his offers front and center on his home page and nearly every page of his website. Why does it work? This strategy succeeds because the offers are omnipresent on his website. When users are browsing the site or reading content that addresses their specific questions, the offers are always there, reminding the reader that there is information free for the taking. Bob’s offers are among the most frequently requested of any of our clients, and we find that the prominence of the offers is a key reason driving the public response. Of course, the books offered are helpful and information-packed, but their chief utility is as extensions of advertisements for the Bob Battle brand, and in that respect they have been triumphant successes.